1Central Fisheries Research Institute, Kasüstü Beldesi, Yomra, Trabzon-Turkey. Black Sea trout (Salmo trutta labrax Pallas, 1811), the subspecies of the brown trout, Salmo trutta, (Linnaeus, 1758), live widely in the Euro-pean Continent including the North-East Black Sea coasts, the Black Sea, the Avoz and Hazar Basins of Turkey (Elliott, 1994). It is called Black Sea trout (Cheritskiy, 1988; Okumus et al., 2004) by some researchers in order to emphasize its geographical origin and some called it Black Sea salmon (Barach, 1962; Solomon, 2000). The Black Sea trout is specified as anadro-mous form (Ryman, 1983; Hindar et al., 1991) by researchers, who analyzed the brown trout into three different ecotypes according to their life styles as brook, sea and lake. 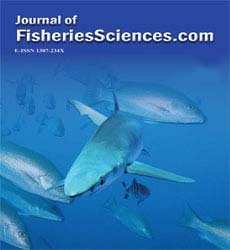 Çiftçi (2006), who studied the population genetics of the brook and sea forms of the Black Sea trout in the East Black Sea region, reported that there is no difference between the two forms and the Black Sea trout, sampled from the rivers disembogued into the East Black Sea belong to the Tuna family group when it comes to its population. The first study regarding the artificial breeding of brown trout was probably carried out by Jacobi in Germany in 1739 and their artificial breeding have been spread in Europe from that date on (Coste, 1853). The adaptation of the Black Sea trout to culture conditions was made in 1998, using the brood stocks taken from the riv-ers in the Black Sea Region in the spawning sea-son (Aksungur et al., 2005). The spawning season of the Black Sea trout, which reach sexual maturity at the ages of 2-3, is the months September-December in the East Black Sea Region of Turkey (Tabak et al., 2002). That fish over 11.5 cm lengths can adapt to sea-water is reported by Kurtoglu (2002), who stud-ied the smoltification features and the loss of parr tags in the adaptation of the Black Sea trout to seawater. Studies to increase the cultivation of this species and to develop natural stocks con-tinue in Turkey. Recently this species is started to be cultivated in the fresh water and sea cages. In an attempt to increase this species’ activity in the aquaculture, research attempts have been focused on the understanding of the factors that affect the growth, feed evaluation and survival rate (Çakmak et al., 2008). Environmental factors such as the temperature of the water and salinity can not be controlled under the farm conditions. When the environ-mental factors change, the metabolic balance re-garding the oxygen consumption changes and the environmental oxygen level can be a limiting factor. The oxygen consumption of Salmonidae spe-cies is affected by a number of factors such as the temperature of the water and the fish size (Fivel-stad and Smith, 1991; Forsberg, 1994); the feed-ing rate (Brett and Groves, 1979); the feeding diet Forsberg, 1997); salinity (Forsberg, 1994); the swimming speed (Wilson et al., 2007) and the stress level (Smart, 1981; Barton and Schreck, 1987; Barton, 2002). That the lethal dissolved oxygen level at temperatures of 7-21°C is 1.6-2.8 mg/L for the brown trout is reported by Dou-doroff and Shumway 1970) in their technical re-port. The effects of the physiologic stress in the acidic water and the effects of low salinity to the oxygen consumption of the juvenile brown trout were studied by Carrick (1981), and Altinok and Grizzle (2003) respectively. Although many authors have studied oxygen consumption using small respirometer chambers in which fish remain inactive, the application of these results to commercial aquaculture is not very realistic (Jobling, 1981). Therefore, it seems more appropriate to determine the oxygen con-sumption rate under fish farming conditions as it is done with the Atlantic salmon, Salmo salar L. (Fivelstad and Smith, 1991; Forsberg, 1994; Fivelstad et al., 1999), juvenile walleye, Sander vitreus (Yager and Summerfelt, 1993), White sturgeon, Acipenser trunsmontanus (Thomas and Piedrahita, 1997), Wolffish, Anarhichas minor (Foss et al., 2003) and Scaldfish, Paralichthys dentatus (Katersky et al., 2006). Oxygen requirement of fish is a fundamental variable of aquaculture system design and man-agement, as it is often the basis for determining water flow rates for sustaining stock (Timmons et al., 2001; Merino et al., 2009) and the artificial re-oxygenation requirements for certain reared fish biomass and the temperature regime (De la Gandara et al., 2002). The Black Sea trout is a commercially im-portant fish in the Black Sea region of Turkey for land based farm and also marine farming. There is a lack of knowledge regarding the oxygen con-sumption rates of Black Sea trout in farming conditions. Therefore, the present study of the oxygen consumption of Black Sea trout between small size fish (54.1 g) and big size fish (507.0 g) was conducted in tank under farm conditions. The determination of oxygen consumption by Black Sea trout in farm conditions will provide valuable information on the oxygen requirement of these fish in an aquacultural setting and should be valuable for designing and managing a rearing facility for the intensive culture of Black Sea trout. The fish used in this study are composed of the 3rd generation individuals that were repro-duced from the fish captured from the Firtina, Kapistre and Çaglayan brooks of the East Black Sea Region of Turkey. All fish used in this ex-periment had kept in tanks of 6 m diameters until the trials, were anaesthetized benzocaine, (0.05 g/L) 5 days prior to the start of the trials, weighed individually and total length recorded to the near-est 0.1 g and 0.1 cm, and distributed to fiberglass tanks of 1.15x1.15x0.5 m at 20 kg/m3 in stock density. Initial biomass was around 8 kg per tank. Each tank had a side water inlet and a central outlet. In this experiment two different size fish were used. The first group defined as small size fish group (n=300), S1 and S2, and the second group defined as big size fish (n=32), B1 and B2, average weights and total lengths were 57.7 ±4.29 g and 18.0 ±0.53 cm, 50.6 ±4.33 g and 17.4 ±0.49 cm, and 507.3 ±27.06 g and 35.8 ±0.62 cm, 506.7 ±23.74 g and 35.3 ±0.64 cm re-spectively. Big size fish were consisting of ma-ture male and female fish. Prior to and during the trial, the fish were fed with commercial trout feed (Blacksea feed, Tur-key) at 08:30 am and 03:30 pm two times in a day by hand until satiation The unfed food and the fish feces in the tanks were flushed 30 minutes after each feeding. Between the trial dates, the sun rose at 06:00 am and set at 05:20 pm at the trial place. All the tanks were flowed constant running seawater filtered by sand filter of 12.0 L/m in flow rate during the trial. The flow rate was checked twice a day. Inflow and outflow water dissolved oxygen (DO) concentrations were measured to ± 0.01 mg02/L with oxygen probes (YSI 556, USA; ox-guard, Denmark), calibrated with the Winkler method, on the basis of 24 hours for 3 days at 20 minutes intervals. One oxygen probe was located into pipeline of inflow water and another probe was moved from one outlet of tank to another by hand. The Specific O2 Consumption Rate VO2, (mgO2kg/h) is calculated according to the for-mula (Jobling, 1982). Where, VF is the water flow (L/h) through the tank, δpO2 the difference in O2 concentration between the inlet and outlet water and B is the total biomass in the tank. To determine the ef-fects of oxygen diffusion from the air into the water corrections for O2 variations between inlet and outlet water were performed in the tanks without fish before start and after termination of the experiment. All statistical analyses were performed with SPSS software for windows. Kolmogorov Smir-nov, t-test, Mann-Whitney and Kruskal Wallis Test were applied to test for overall differences between oxygen consumption rates in groups and days. Significant differences were established 0.05 level. The big size fish used in the first trial were 2+ years old and some of them have reached sexual maturity and females were striped around 1 month before trial. The small size fish were adapted to the seawater 3 months prior to the trial. The initial mean weight of the fish was not significantly different between B1 and B2 and also S1 and S2 (t-test, P>0.05) and no mortality occurred in any of the experimental groups throughout the study. Mean daily oxygen consumption rate ranged from 95.2 ±2.13 to 140.0 ±2.90 mgO2kg/h ac-cording to fish size (Table 1). Oxygen consump-tion was significantly influenced by fish size (Mann-Whitney, P<0.05). Interaction tested be-tween daylight and night on Specific O2 Con-sumption Rate in the big and small size groups were significantly different (Mann-Whitney, P<0.05) (Table 2). Mean daily oxygen consump-tion in the big and small size groups among days were not significant (Kruskal Wallis Test, P>0.05). Water temperature averaged 10.0 ±0.01°C during the experiment. Table 1. Mean Specific O2 Consumption Rate (mgO2kg/h) for Black Sea trout in two different weights in aquaculture tank environment (±SEM). Table 2. Mean Specific O2 Consumption Rate (mgO2kg/h) in daylight and night (±SEM). Regarding newly initiated reproduction of Black Sea trout in the region, the dissolved oxy-gen plays a key role in the building cultivation system and rearing plans. The oxygen consump-tion of salmonid species is affected by the tem-perature and the fish size (Fivelstad and Smith, 1991; Forsberg, 1994). Black Sea trout as a salmonid is cold water species and so water tem-perature was kept to closest its optimal tempera-ture in present study. The feeding rate (Brett and Groves, 1979) and the feeding diet (Forsberg, 1997) also have an important effect on oxygen consumption and thus feeding two times in a day by hand until satiation closed to farm condition was assigned as feeding rate and method. This study showed that the specific oxygen consumption rate of Black Sea trout is lower in big size fish than that small size fish. Fidhiany and Winckler (1998) reported that the specific oxygen consumption decreases with increasing age and the general consensus is that oxygen up-take is directly proportional to the water tempe-rature and feeding ration, and inversely proporti-onal to fish size (Brown et al., 1984; Forsberg, 1994; Tudor, 1999). The oxygen consumption data obtained in present study are comparable with studies of Carrick (1981), and Altinok and Grizzle (2003) for Brown trout. Fivelstad and Smith (1991) and Forsberg (1994) for Atlantic salmon and Webb (1971) for rainbow trout (Table 3). However, the specific oxygen consumption rates of the two groups are lower than the values obtained by Fivelstad et al. (1999) in their study for the juvenile Atlantic salmon in 60-80 kgm-3 harvest stock density. The specific oxygen con-sumption rates of the big fish group in present study are in harmony with the oxygen consump-tion rate reported by Forsberg (1994). It has been observed in the two fish groups that the oxygen consumption increases at the daylight period when the feeding and flushing activities take place (Figure 1). Figure 1. 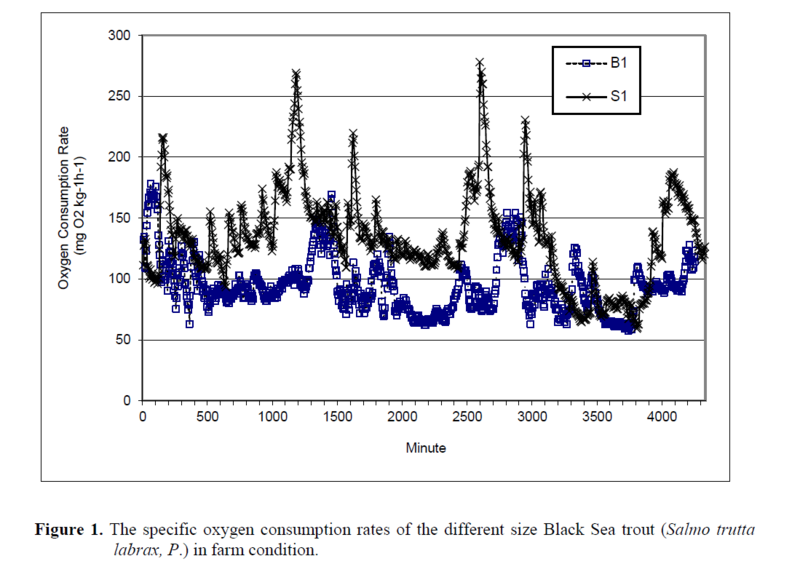 The specific oxygen consumption rates of the different size Black Sea trout (Salmo trutta labrax, P.) in farm condition. The routine activities in the fish rearing such as tank cleaning, weighing, fish-grading, car-riage, treatment applications, anaesthetization and taking samples are stress factors (Flos et al., 1988). It is reported by Smart (1981), Barton and Schreck (1987) and Barton (2002) that stress in-creases the oxygen consumption of the fish. In present study both fish groups consume more ox-ygen in the daylight period (06:00 am-05:20 pm) when the activities such as feeding and tank cleaning take place than the dark period (05:20 pm -06:00 am). The increase in the oxygen con-sumption of the fish during the daylight period when compared to the night period may stem from the stress factors. No prior study regarding the oxygen con-sumption of the Black Sea trout at the tempera-ture of this study and with 18‰ salinity rate is found during the literature search. In this study present data of the oxygen consumption of this fish will not only help in solving the problems faced in fish rearing and live fish transfers but also help in boosting the cultivation of the Black Sea trout and making it outstanding in the aqua-culture. Consequently, the determinations of oxygen consumption in this research for Black Sea trout in farm conditions provide valuable information of the oxygen requirement of these fish in an aq-uacultural setting. This information can be used for designing and sizing of a rearing facility for the intensive culture of Black Sea trout. This study is conducted at the Central Fishery Research Institute within the scope of the TAGEM/HAYSUD/ projects no 2006/09/03/02, which is financed by the Turkish Republic Min-istry of Agriculture and Rural Affair, General Di-rectorate of Agricultural Research. Aksungur, M., Yilmaz, C., Tabak, I., Aksungur, N., Misir, D.S., (2005). Adaptation of Black Sea Trout (Salmo trutta labrax, Pallas, 1811) to Culture Condition. Firat University, Journal of Science and Engineering, 17(2): 349-359. Barach, G.P., (1962). Black Sea Salmon Project. EU TACIS BSEP. Georgia Academy of Sci-ence of Georgia, pp. 64. Brett, J.R., Groves, T.D.D., (1979). Physiological energetics. In: Hoa, W.S., Randall, D.J. and Brett, J.R (Eds. ), Fish Physiology, Bioener-getics and Growth, VIII: 279–352. Cheritskiy, A.G., (1988). Black Sea Trout Smolts (Salmo troutta labrax) in the Kodori River, Voprosy Ikhtiologii, 4: 654-663. Coste, M., (1853). Instructions pratiques sur la pisciculture, suivies de mémoires et de rap-portssur le même sujet. Paris: Librairie Vic-tor Mason. Çakmak, E., Kurtoglu, I.Z., Aksungur, N., Firidin, S., Çavdar, Y., Esenbuga, H., Zengin, B., (2008). Rearing and Restocking of Black Sea trout (Salmo trutta labrax Pal-las, 1811). Project report, 128 pp. Çiftçi, Y., (2006). Study of Genetic Structure of Trout (Salmo trutta Linnaeus, 1758) and (Salmo platycephalus Behnke, 1968) Popu-lations in Turkey Using mtDNA- RFLP Analysis. Ph.D. Thesis, Black Sea Technical University. Doudoroff, P., Shumway, D.L., (1970). 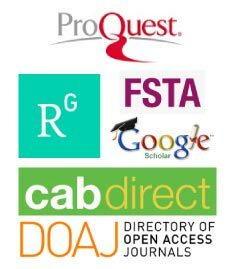 Dis-solved oxygen requirements of freshwater fishes. FAO Fisheries Technical Paper, No. 86. Elliott, J.M., (1994). Quantitative ecology and the brown trout. Oxford University Press, Ox-ford, pp. 1-304. Kurtoglu, I.Z., (2002). Evaluation of Brown Trout (Salmo trutta L ) production under Intensive Culture Condition and Determina-tion of Its Ranching Potential. Ph.D. Thesis, Istanbul University. Okumus, I., Kurtoglu I.Z., Atasaral, S., (2004). General Overview of Turkish Sea Trout (Salmo trutta L.) Populations. Sea Trout: Biology, Conservation and Management. Proceeding of the First International Sea Trout Symposium. Cordif. July 2004.115-127 pp. Smart, G.R., (1981). Aspects of water quality producing stress in intensive fish culture. A.D. Pickering (Ed. ), Stress and Fish. Aca-demic Press, London: 277–293. Solomon, D.J., (2000). The Biology and status of the Black Sea salmon, Salmo trutta labrax. EU TACIS BSEP. Black Sea Salmon Pro-ject. Draft report. 26 pp. Tabak, I., Aksungur, M., Zengin, M., Yilmaz, C., Aksungur, N., Alkan, A., Zengin, B. and Misir, D.S., (2002). Determination Biologi-cal Features of Black Sea Trout (Salmo trutta labrax P.) Project Report (1998-2002), 246 pp. Timmons, M., Ebeling, J., Wheaton, F., Summer-felt, S. and Vinci, B., (2001). Recirculating aquaculture systems. NRAC Publication No. 01-002. Cayuga Aqua Ventures, NY, USA, 650 pp. Webb, P.W., (1971). The swimming energetics of trout. II. Oxygen consumption and swim-ming efficiency, Journal of Experimental Biology, 55: 521-540.